You may also join in the effort to maintain the repository by joining the Mendeley group. 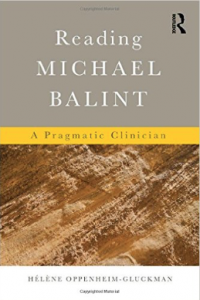 Michael Balint is above all known for the "Balint Groups", which came to be a generic term for groups involved with the training of doctors and caregivers in the patient-caregiver relationship. Despite this, the origin and full import of his work has been somewhat overlooked. Hélène Oppenheim-Gluckman provides us with a concise account of how reading Balint has enriched psychoanalytic theory and its practice by broadening the indications for the psychoanalytic cure and the debate on psychotherapies and the training to the professional care-giver-patient relation. This text may be ordered via Amazon.